Bali (Indonesia : Province) - Concerning a two day pro-amateur event in Bali. 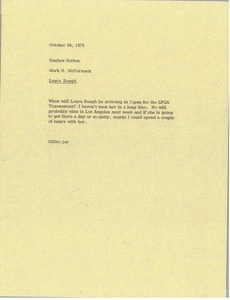 McCormack notes his conversations with Bruce and suggests details such as, format, players, timing, and other matters. 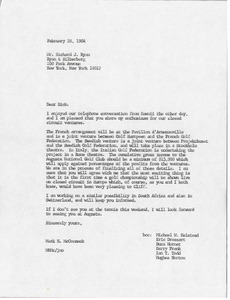 McCormack writes regarding closed circuit television broadcasting of golf tournaments in Europe and lists the partners in France, Sweden and Italy. 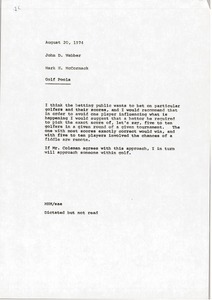 McCormack sends six sentences regarding the 1973 Inter Maritime International Pro-Amateur Golf Tournament in Honor of the Pertamina Oil Company. 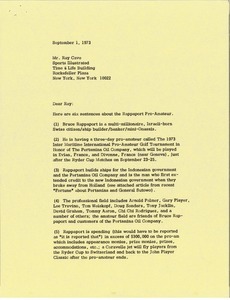 They describe Bruce Rappaport, the golf players, the cost and other details. Memorandum regarding golf pools and how betting should work. 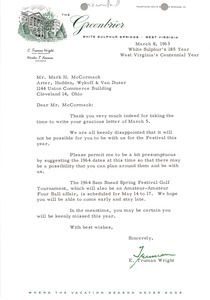 White Sulphur Springs (W. Va.) - Wright voices disappointment that McCormack will not be able to attend the Sam Snead Spring Festival Tournament at The Greenbrier. 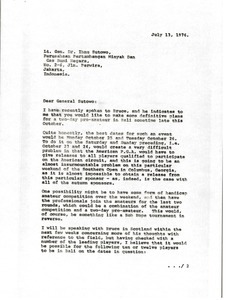 He therefore informs McCormack of the 1964 tournament dates, in hopes that he will be able to put it on his calendar. 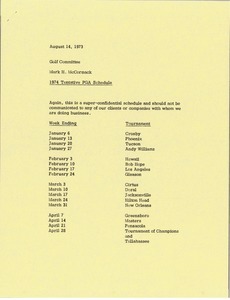 Listing the 1974 tentative PGA schedule. 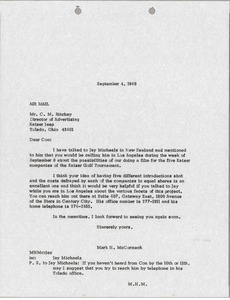 McCormack informs Ritchey that he has talked to Jay Michaels, who will be in touch with Ritchey to discuss the possibility of doing a film for the five Kaiser companies of the Kaiser Golf Tournament. Requesting the cumulative Sony Ranking totals of the eight seeded teams before German sends the fax to the IAC. 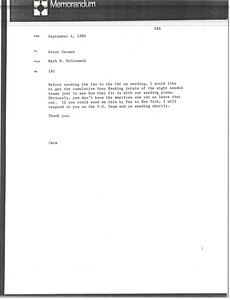 Confirming discussions held at Augusta concerning the production of five television matches involving United States and world players for British Independent Television. 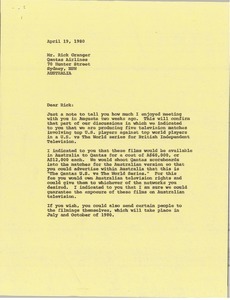 McCormack provides an overview of the terms of the film availability to Qantas in Australia including cost, title identification, and televising. In addition, McCormack specifies the United States and world team players.